The British cats and kittens from Moscow monobreed cattery Ridolina. 3 European Champions, 11 Greater International Champions, 14 International Champions. The cattery is registered since 1995. In a basis genes of the best manufacturers of the British breed from Russia, Germany and Holland are incorporated. 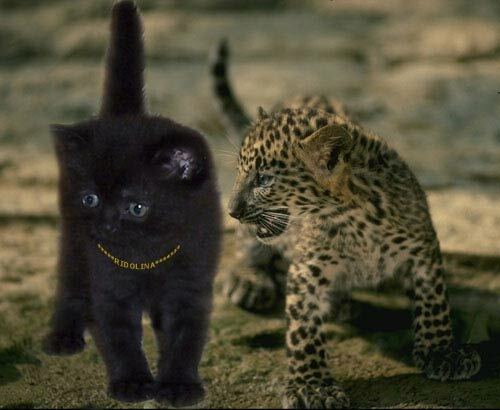 The British cats participate in cultivation, blue and black colors only. Its not a random choice. Blue color for the British cats is classical (initial), and black in a combination to amber eyes, creates unique, tremendous effect. Our British cats and kittens receive good education. They are created to become an ornament and astral defenders of your House! The British breed of cats is unique. Features of the British cats consist in their unique appearance, charm, quiet character, high intelligence, congenital cleanliness, stability to diseases. Getting the British kitten, you become the owner of the British Cat with manners of the aristocrat! Our British kittens have a full family tree (in 5 generations only the BRITISH SHORT-HAIRED ANCESTORS), club registration, the veterinary passport, the titled parents. Are grown up in our cattery, in conditions of a city apartment, tender and playful, are adapted for noise of home appliances. Our British kittens Use natural products, and forages super premium a class. Are accustomed to a biotoilet and crash. To learn about our cattery of the British cats, history of its creation, to look a photo and video of the British kittens from the first hour of a life on present time, the British cats (their parents) and the British kittens from others litters, to send the application for the British kitten, you can on a site. We guarantee constant support to owners of our British kittens on all questions of the maintenance. Photo © Tipikina Galina Sergeevna Use of materials of a site probably only from the sanction of the owner and the direct reference to a site.